When packing my bag, I carefully choose my projects: a delicate lace shawl, a simple pair of socks, the tunic-length pullover needing row after row of stockinette. Before I pack anything else, I pop a ball of soft, light-colored, worsted-weight yarn and a pair of needles into the bottom of my tote for the inevitable request. Most often this happens at family gatherings. Someone watches me knitting as I chat, fingers flying. She sidles up to me. “Do you think I could learn to knit someday, cousin LA?” She eyes my needles and her fingers inch toward them. I pull my unfinished sock out of range and grab the extra yarn and needles from my tote. Smiling, I invite her to sit next to me. That’s why I travel prepared. When teaching knitting on vacation, I don’t show my students how to cast on. Casting on 20 stitches takes me no time. I even knit the initial row as I demonstrate the basic stitches. Make sure you tell your cousin (or your niece or uncle) what you are doing, show her how to do it, and then push her out of the nest to do it herself. Settle yourself so your cousin can see your hands in the same way she will see her hands. The most effective way is to sit in a chair and have her stand behind you and look over your shoulder. Alternatively, you can have her peep over your arm as you sit next to each other. • Insert the right-hand needle into the front of the stitch through to the back of the left-hand needle. • Wrap your yarn, making sure to trap the yarn between the two needles. • Using the right-hand needle, pull the yarn through the loop. • Slip the completed stitch off the left-hand needle. Make sure to knit stitches slowly as you demonstrate so she sees each step distinctly. Watching you repeat that knit stitch several times reinforces her understanding. Now, it’s her turn! Hand your cousin the needles and get her set to go. 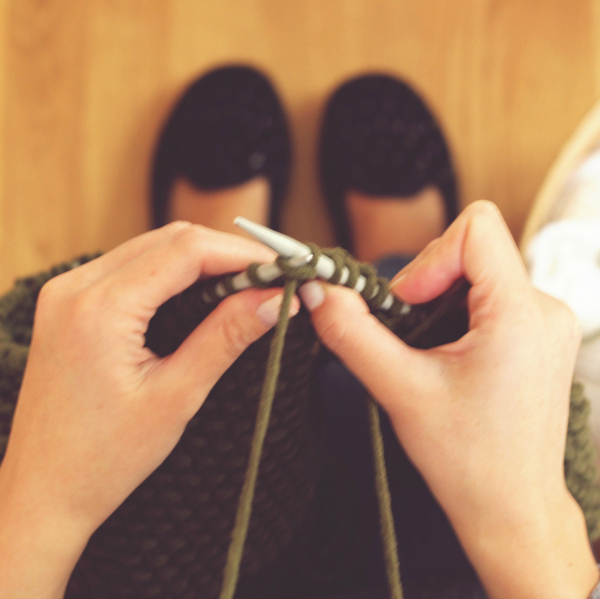 Using the same words, speak each step aloud as she creates her very first knitted stitch. Pick up your knitting and continue to demonstrate the knit stitch so she can check herself against your actions. After a few stitches, you’ll notice your cousin isn’t paying attention to you anymore. Watch and make sure she’s completing each stitch. If she is, relax. She’s concentrating. Pick up your work and go back to chatting. When she makes her inevitable mistake, don’t worry about teaching her how to fix it. 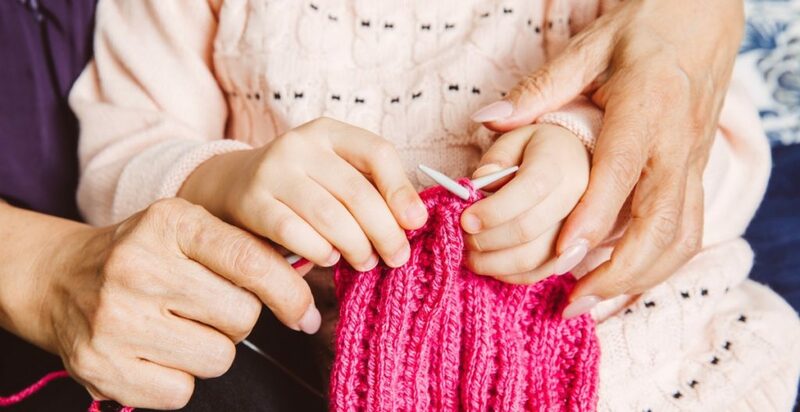 In the beginning stages of knitting, having the knitter continue to knit is more important than showing her how to correct the mistake. Take the piece when she shoves it at you and find the error. Most often, the mistake is revealed by extra stitches or holes in the knitting. You’ll find she is not completely knitting stitches, but simply wrapping the yarn and slipping the stitch. As her confidence grew, her knitting speed increased, and she began to skip steps! Explain what she did and resolve this issue by having her repeat those word cues aloud as she completes each stitch. This simple action forces her to create a fully formed stitch every time. Once she’s knitted for a while, leaving a trail of mistakes and holes and unknitted stitches in her work, her rows will begin to even out. Bind off the swatch and give it to her as a souvenir—her very first knitted thing! Cast on again and watch the garter stitches flow from her needles. Watching a brand-new knitter concentrate as she slips stitch after stitch onto her needle is one of my great joys in life. Whether she is eight or sixty-eight, you have gifted your cousin (or niece or uncle or friend) with a love of fiber. Or at least something you can do together at the next family reunion. 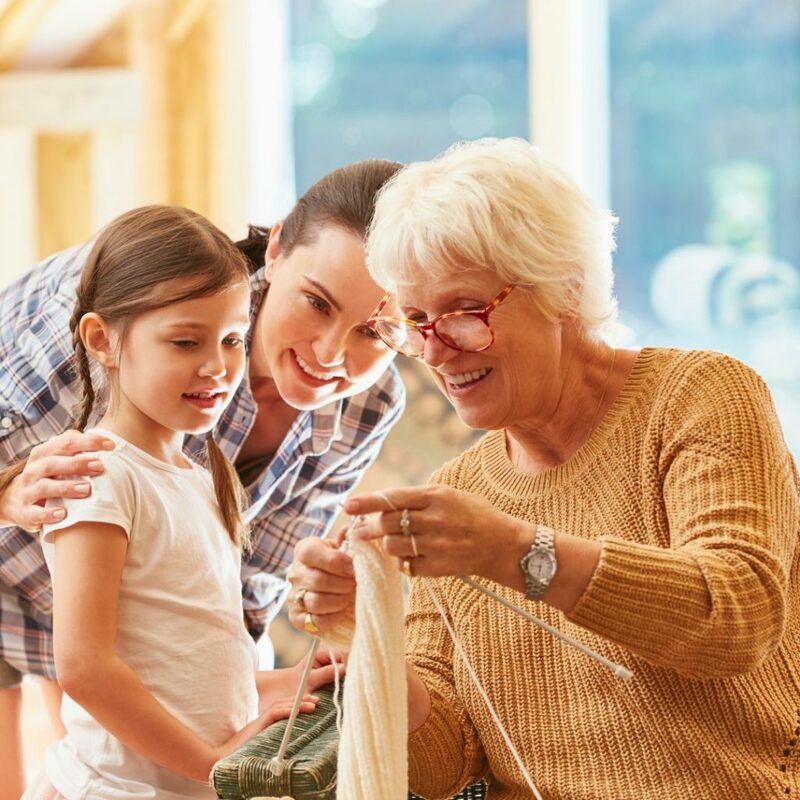 LA Bourgeois teaches knitting professionally as well as to family members across the United States. She shares her knitting adventures, designs, and tips and tricks online at www.housewyfe.com. Check Out These Beginner Resources!